Tanaka was born in Shimonoseki, Yamaguchi Prefecture, Japan. She became a leading actress at an early age, appearing in Yasujirō Ozu's I Graduated, But... in 1929. The following year she played the lead in Aiyoku no ki, and in 1931 she appeared in Japan's first talkie, The Neighbor's Wife and Mine, directed by Heinosuke Gosho. She had a close working relationship with director Kenji Mizoguchi, having parts in 15 of his films, including leading roles in The Life of Oharu (1952), Ugetsu (1953) and Sansho the Bailiff (1954). 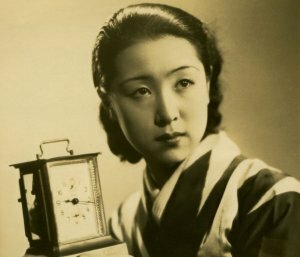 Their working relationship ended when Mizoguchi countered a recommendation from the Directors Guild of Japan for the Nikkatsu studio to hire her as a director. Despite this, the production of her second film as director went ahead, but Tanaka never forgave Mizoguchi, and the reasons for his behaviour are unclear. She also played Noboru Yasumoto's mother in Akira Kurosawa's Red Beard (1965). For her portrayal in Kei Kumai's Sandakan N° 8 she won the Best Actress Award at the 25th Berlin International Film Festival in 1975. Her last screen appearance was in 1976 in Kei Kumai's Kita No Misaki. Tanaka was the second Japanese woman who worked as a film director, after Sakane Tazuko (1904‐1975). Her first directing job was on the film Love Letter in 1953, and she made five further films in that role.